A group that was diverse, including legal advocates, a number of religious leaders and bus loads of supporters from out of town marched in Springfield, Ohio to Speaker of the House John Boehner’s office demanding to receive a path to citizenship. The rally was to urge the Speaker of the House to push his party members for a path to citizenship for the nearly 11 million immigrants who do not have documentation, now residing in the U.S.
Union officials, religious leaders, legal advocates, visitors from out of town and even residents marched from downtown to City Hall, where Boehner keeps a local office. One member of the crowd was Ester Arteaga, a naturalized citizen who lives in Louisville and is originally from Guatemala. She became a citizen just two years ago and was at the rally to help others who just want to live a peaceful life while working in the U.S.
Arteaga, along with her husband and their two children all sought to become citizens at the same time. It took them nine years to reach their goal. Boehner said during last week in Washington that his colleagues were committed to immigration reform. He said the GOP want to fix the system that is broken and is working on an approach that is step by step to make sure the people of U.S. are confident the issues are being addressed both honestly and openly. The rally that took place outside the office of Boehner was one of three different events to be held this weekend. Another rally was set for Virginia to target Eric Cantor the House Majority Leader and Peter Roskam, in Illinois, the Deputy house Whip. 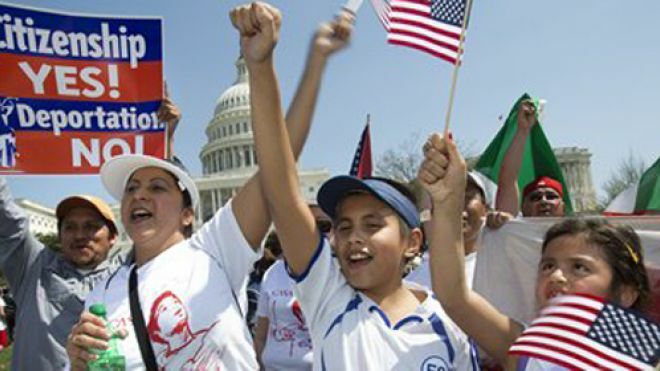 GOP leaders including Boehner have rejected the immigration bill passed in the Senate that includes a path to citizenship for the 11 million. The GOP instead, wants to work on the reform on a piece meal basis starting with border security.